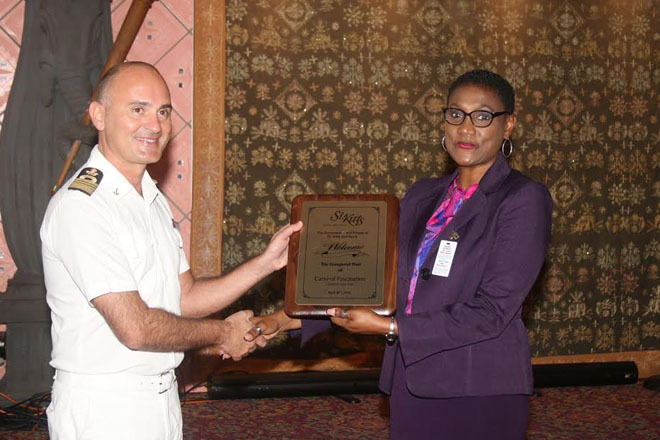 (ZIZ News) — The Carnival Fascination was welcomed on its inaugural call to St. Kitts on Friday with a plaque exchange ceremony held aboard the 2,594 capacity cruise liner. Permanent Secretary In The Ministry of Tourism Carlene Henry-Morton spoke of the longstanding relationship with the Carnival cruise line stating that St. Kitts is proud of the partnership. “At the Ministry of Tourism we are very proud to be once again welcoming to our shores another of the Carnival Cruise Line’s ships. This today is the Carnival Fascination. On Tuesday we had the Carnival Elation and it is developing into a very good habit to have Carnival Cruise Lines sending their ships unto our shores. We have a longstanding very productive relationship and today we are very glad that they have chosen to make another inaugural call through the Carnival Fascination,” she said. The ship’s captain said he is honoured to anchor the Carnival Fascination in St. Kitts for the first time and looks forward to returning to the island. This makes the second visit by a Carnival cruise liner this week following the Carnival Elation’s arrival on Tuesday. The Carnival Cruise line has a total of 12 ships visiting St. Kitts, bringing close to 300,000 visitors in this cruise season.